It’s the little things that really matter sometimes. The cherry on top of a sundae, the light scent of gardenia on a warm spring breeze and a mortgage that’s assumable are each all about the details, and are sometimes overlooked by people who are in a hurry to get from Point A to Point B. But that assumable mortgage may make your home more competitive if you’re a seller or save you a bundle if you’re a buyer. All mortgages are structured uniquely, such that the majority of any payment made before about halfway through the loan is interest (depending on your down payment and rate), so it would naturally follow that some people would want to shortcut this early period and get on to paying on the meat of the loan. The buyer would then take over the payments from the seller, without the loan changing terms at all. This is, in essence, how an assumable mortgage works. The buyer will also have to bring some amount of money to closing, either in the form of cash or a secondary mortgage loan, to compensate the seller for the remaining value not covered by the assumed loan. Assumable mortgages can be of any variety, depending on the age of the loan, but the ones you’re most likely to see today are FHA, USDA or VA-type mortgages. To qualify, a buyer still has to meet all the same requirements that the seller had to meet in order to get their mortgage. This wasn’t always the case, but is today. And although rates are still fairly low right now, in the 4.5 to 5 percent rage, over the next few years several rate increases are anticipated. That means that your mortgage terms themselves might be worth something when you go to sell your home. Provided your buyer can qualify for your loan and come up with the cash it takes to make the total meet your home’s value at the point of sale, you could find yourself with a more than full price offer, or even multiples, just by making it known that your loan is assumable and you’re ok with letting someone take advantage of this feature. Why Would a Buyer Want an Assumption? This is a bit of a trickier question, which will require a chart. Let’s say that your mortgage rate is 3 percent on a 30 year fixed note. You’ve had this loan for five years, but it’s time to move on to a bigger home, you had no idea you were going to have triplets when you chose this house! A buyer comes along when rates are at 4.75 percent and wants to assume your mortgage and pay you a total of $250,000 for your place. So far, so good. Assuming the buyer’s first payment on the assumed note is number 61, they’ll immediately pay almost $500 of the principle down. 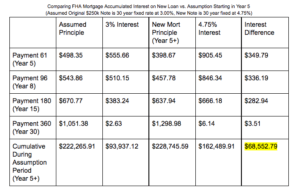 If they had taken out their own note, totally ignoring the additional mortgage insurance and upfront mortgage insurance that an FHA would require, they’d only pay down about $400 at this same point (which is five years down the road, remember). They’d also pay almost $350 more in interest. Keep in mind that the payment at 4.75 percent interest is also higher, but when the higher payment is paying less of the note off each month, there’s nothing about that that makes it a good financial move. If the buyer did manage to pay their note all the way off, they’ll find that they paid $68,552.79 more in interest alone by choosing to get a new loan. Provided the additional funding required to secure this home wasn’t cost prohibitive, it just makes good sense for a buyer to want to assume a loan. Beyond the savings mapped out above, their closing fees will be considerably smaller, making the net gain even larger. Of course, both buyer and seller should discuss this with your lender or financial planner to be sure that it’s the right decision for them and their financial pictures. For a seller, the picture is a little different. Although it doesn’t cost you anything to start the assumption process, it can get ugly if a seller doesn’t know to protect themselves and a buyer ends up defaulting on their assumed loan. You must make certain that you’ve signed and received back a fully executed (all parties have signed it) copy of a release from liability form. Remember, the bank has to also agree to these terms. Beyond that, it can be a good deal for you as the seller, too. You’ll get a big chunk of cash, you’ll be free of your mortgage so you can buy something a bit roomier or closer to work. Assumptions can be tricky to close, but the more that are closed in the coming years (and there are likely to be a few), the easier they’ll get because everyone will be on the same page. Note: If you’re a veteran with a VA note that you’re trying to sell to a buyer who wants to assume, the mortgage will retain your entitlement. This is why it’s important to only sell with an assumption to another veteran. With another vet in the equation, the bank can exchange your entitlement for that of the new borrower, allowing you to buy again using a VA loan.